The first of four curatorial essays in the catalogue for the Remai Modern’s inaugural exhibition, Field Guide, begins with a quotation from Édouard Glissant, the Martiniquan thinker about hybridity, multilingualism and Creolization. The last essay ends with one. This quotational choice is anything but insignificant. Glissant was a leading figure among Francophone anti-colonial, abolitionist writers, a poet and theoretician of the emancipation and freedom of Black peoples. Quoting him means taking a stand, and in the case of the Remai Modern, which one? 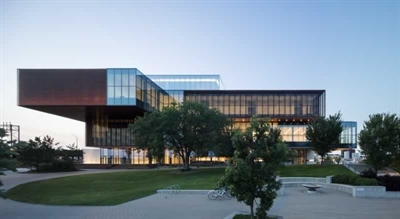 In its literature, the Remai Modern presents itself as a beacon of hope. The “About” page on its website tells us that it is “committed to interrogating the idea of ‘modern’ from multiple cultural, historical and contemporary positions” and “a leader in developing new models for sharing knowledge and engaging diverse communities.” As art has much to teach us about what distinguishes and divides us, what we have in common and what unites us, the new museum’s visitors will be exposed to a wide variety of works from Saskatchewan, Canada and abroad that make up modern art’s heritage. Visitors will be encouraged, through contact with these works, to put the part they play in our society into perspective and question it, as accentuated by different and often deep cultural divides. To borrow an apt image from a former curator at the now-closed Mendel Art Gallery, will the coming of this big spaceship really make Saskatoon the epicentre and summit of inclusive and collective reflection on the meaning of coexistence among diverse cultural communities with a troubled history of interaction? Hope is boundless. In the Field Guide catalogue’s opening essay by Sandra Guimarãesas, the museum’s chief curator, Baudelaire’s figure of the wanderer (flâneur) is taken as a metaphor for the visitor, who “walks through the exhibition, a montage or works, and confronts ideas through which they can assemble their own understanding of the contemporary condition at large.” But what happens if the simple act of walking and strolling freely in public spaces, such as on the street, at the library, on public transport or at the museum, is a matter of privilege? During the Remai Modern’s first panel discussion, which followed a screening of Tasha Hubbard’s documentary 7 Minutes (2016), Nēhiyaw philosopher Erica Violet Lee, one of the organizers of Idle No More who grew up in the inner-city district next to the museum, described how Indigenous women are consistently restricted in their movements and the simple act of walking freely in the street is impossible without being subjected to continual, omnipresent harassment and gender-based violence. With her insights, Lee helps to put the flâneur figure in perspective. Since historically art museums have helped to establish the social divide, to paraphrase Bourdieu, we have to wonder whether all members of society will feel welcome to roam through its galleries. This ambitious stage production is to be presented in February and March 2018 at the Persephone Theatre, which is next door to the Remai Modern and connected to it by an indoor passage. Its writers and designers intend to demonstrate that the West’s Francophone, Indigenous and Métis peoples did not submit to blending together “without making a stink in the Canadian melting pot, which stands for what is ‘modern’ and ‘progressive’.” Through the magic of theatre, the play takes a critical look at what memories remain of the Métis rebellions of 1870 and 1885. On this point, the playwrights’ aims and those of the museum’s curators converge – art sharpens our vision of the past, forces us to ask searching questions and is able to project us into the future. This in fact could make the Remai Modern an ideal site for a discussion between the audience and the artists involved in the eagerly anticipated show. To be kept in mind is that Saskatoon is where the Idle No More movement got its start, and the very first piece in the new museum’s very first catalogue, Imagio Pietatis – A New Wave for Ozone by Cree-Métis painter Robert Boyer (1948-2004), was an excellent choice by artists Tanya Lukin Linklater and Duane Linklater. The sceptics will call this museum project a high-risk gamble that is doomed from the start, given its geographical location. The indefatigable optimists will see, in Saskatoon, the hope for an artistic statement firmly grounded in its context, one that encourages a collective aspiration to reconcile a diversified audience through an encounter with bold, moving works. While the question now on everyone’s lips has to do more with numbers – how many people will want to enter the vessel? – its sleek design has for the time being given residents of the City of Bridges a reason to dream. Must See: Belle comme le jour, a French-language film with English sub-titles being shown in the Remai Modern’s screening room until 25 February 2018, as part of the Field Guide exhibition. Personal Favourite: Occupation, 32 photographs by Palestinian artist Ahlam Shibli, in the Marquee Gallery on the museum’s 3rd floor until 25 February 2018, as part of Field Guide. Not to Be Missed: Gabriel Dumont’s Wild West Show, from 27 February to 4 March 2018 at Persephone Theatre. http://persephonetheatre.org/events/gabriel-dumonts-wild-west-show. 2) Benito Perez, “Le Canada est toujours une colonie [Canada is still a colony],” Le Courrier, 21 April 2017, https://www.lecourrier.ch/148742/le_canada_est_toujours_une_colonie. Jean-Philippe is originally from Ottawa and currently resides in Saskatoon. He is the author of visual arts criticism, interviews and profiles of artists and musicians, notably for Muse, the Canadian Museum Association’s magazine, Ottawa Xpress, Le Panoptique, the AKA and Sans-Atelier artist-run centres, BlackFlash Magazine and L’Eau vive. He has worked for 15 years in arts and culture.